Jude and her twin brother, Noah, are incredibly close. At thirteen, isolated Noah draws constantly and is falling in love with the charismatic boy next door, while daredevil Jude cliff dives and wears red, red lipstick and does the talking for both of them. But three years later, Jude and Noah are barely speaking. Something has happened to wreck the twins in different and dramatic ways... Until Jude meets a cocky, broken, beautiful boy, as well as someone else, an even more unpredictable new force in her life. The early years are Noah's story to tell. The later years are Jude's. What the twins don't realize is that they each have only half the story, and if they could just find their way back to one another, they’d have a chance to remake their world. Twins Noah and Jude have always been inseparable and share a special bond. Noah is the quiet sibling, preferring to spend his days lost in his artistic talent. Jude likes to surf and socialise while lost in the pages of her late grandmother's bible, a God in which she refers to as Clark Cable. Both siblings connect through their artistic expression, something both parents encourage. Where Jude has a loving and close bond with their father, Noah is left on the outer and often directs his anger towards the man that seems to forgotten he has a son. But through Noah's raw and incredible talent, he finds a special bond with his mother, visiting museums and inciting a friendly competition between the two siblings with the hope of both being accepted into the school of fine arts. Noah dreams of becoming an artist, finally being accepted by a community that doesn't resort to targeting him for being gay. But in a heartbreaking and devastating set of events, Noah and Jude's world is torn apart, their once close relationship withering as a result of the aftermath. Now Jude and Noah are shells of their former selves. Noah has is now the social twin, opting to spend his time with Jude's former friends, while Jude has retreated to the safety of her Grandmother's bible and living life with care and precautions. Their relationship is strained and it will be Jude that will do the unforgivable. Noah is no longer painting and has lost his zest for life. Once two halves of a whole, they'll need to move mountains to reunite once more... Or stone sculptures from a man who knows what life is like to have loved and lost. I can't even begin to describe how lyrical and utterly beautiful I'll Give You The Sun is. Told from dual points of view, siblings Noah and Jude are best friends, companions and share a special connection that only twins share. Until it all falls apart. Before their world is torn apart, Noah is the quiet twin, bullied by two local thugs who suspect Noah may be gay. His only saving grace is Jude. Jude is the golden child in the eyes of their father, she loves to surf and has always been the bright and lovable tomboy. Until recently. Their mother has taken a keen interest in Noah's artistic talent and Jude begins to lash out. Vying for her mother's attention has lead Jude down a dangerous path... But the roles have reversed and Jude is now withdrawn and relies on superstitions and fate to guide her through life. Throughout the pages, we see the stark differences between both siblings in current day and before the event that ultimately drove them apart. The flow between the character development and regression was stunning, siblings who are ultimately fighting their own battle in what could also be classed as an intricate coming of age. What ultimately drew me into the storyline is the writing. The Sky is Everywhere was stunning, but I'll Give You the Sun is simply phenomenal. It's lyrical beauty is wondrous. He floated into the air high above the sleeping forest, his green hat spinning a few feet above his head. In his hand was the open suitcase and out of it spilled a whole sky of stars. Noah's point of view is more romantic and whimsical, he paints within his own thoughts and sees his world as brushstrokes waiting to be painted. Where Jude's feet are firmly planted on the ground, she's the logical thinker, who now is lost within superstitions and her grandmothers old bible that she lives by as a self help book. It also explores grief, first love, sexual orientation and navigating the period between child and adulthood. "For the sun, stars, oceans, and all the trees, I'll consider it," I say, knowing she'll never agree. She knows how badly I want the sun and trees. We've been dividing up the world since we were five. Never have I encountered a contemporary so utterly lyrical. I inhaled it's beauty and devoured it. This is the year of the young adult contemporary and I'll Give You The Sun is by far one of the best books I've ever had the pleasure of reading. I really loved this one too. It's so well-written and it's just so lovely and lyrical, like you said. I need to read Nelson's debut still! The Sky Is Everywhere was one of the first contemporaries I'd read when I returned to reading, and it left me an emotional mess. It was just so lovely. But I'll Give You The Sun is phenomenal. Based on this book alone, she's skyrocketed to the top of my favourite authors list. I'm one of those weirdos who didn't actually like The Sky is Everywhere. I DID love this one, though. The writing was just gorgeous, wasn't it?? At all? I thought it was absolutely lovely, but I'll Give You The Sun completely blew it away. So, so beautiful. Thanks Zoe. It was just so achingly perfect. I'm a big fan of lyrical writing, but without being over the top and this was the perfect balance. Yes, bump it all the way to the top. It's emotional, but not heartbreaking as such. It's beautiful, hopefully and I think you'll absolutely adore this one as much as I have Benish. Can't wait to see what you think of it. Me too. So composed and incredibly lovely. I would love to see her try her hand at fantasy. Be still my beating heart! I...didn't love this one. WHAT IS WRONG WITH ME. It was good, but I just didn't feel attached to the characters much, although the writing was very, very beautiful. Oh no. I would have thought you would have loved this one too Kara. Even though this wasn't for you, definitely try her debut novel, The Sky is Everywhere. It's utterly gorgeous and might be more your style. It's a softer and more emotional contemporary. This book. It was so beautiful. Those two were just.. I don't know, I love them to pieces. One of the best books I've read last year and I want to reread it!!! Me too Frannie. It was glorious! So lyrical and utterly beautiful. I loved them both, but Noah even more so. He was just so lovely to read, painting in his head especially. Jandy Nelson is phenomenal. It is poppet, and this one is certainly leading the way. I loved his point of view especially, he was such a darling character, really lovely. Give it a go Amy, the writing is incredibly lyrical, but fits with the storyline beautifully. 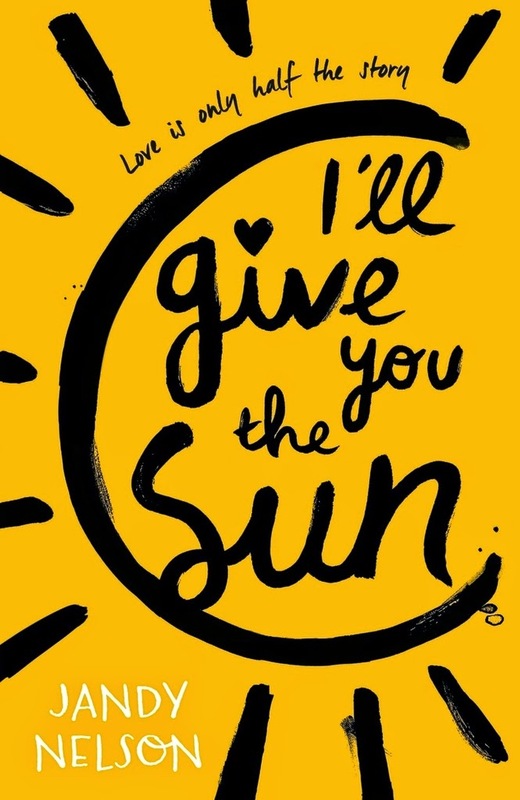 I'll Give You the Sun is undoubtedly one of the sweetest YA contemporary novels of all time. I absolutely loved this one and I cannot express to you how much this one made me cry. it was beautiful and sad but full of hope and oh it just warmed me up inside. i'm so happy you loved it too Kelly! Wasn't it just. I absolutely adored it too Lily. I'm a big fan of lyrical prose, and no one does it better in young adult contemporary than Jandy Nelson. So glad to hear you loved this one Kelly! The writing was lyrical and artistic and definitely something else. I have never read a book like this one, not gonna lie, it took a while to get into for me but I definitely ended up enjoying and appreciating it. I think the lyrical style of writing could divide readers really, but I can't imagine many people not enjoying this on some level. I'm all about flowery writing though, I blame Tahereh Mafi for that. She introduced me to a world of lyrical words and I'm completely hooked now. Me too Marianne! I absolutely loved Noah especially. His point of view was so dreamlike and really whimsical. So glad you loved this one too. I am dying to read this book! I am a sucker for beautiful writing and this one sounds perfect! Plus, I also love the fact that this story focuses on the relationship between siblings. Just a bit a tweaking. But thanks Mishma, I really appreciate the compliment. You need this book in your life. It's absolutely breathtaking! The main focus is definitely on the sibling relationship, but it also explores first crushes and a romance as well. Just incredibly lovely and a must read! I've heard so many good things about this one and am looking forward to reading it!! I think Cait is one of its greatest promoters, and with you and her leading the helm, I know this is going to be a great read. I love that it has a whimsical, surreal feel; how the lyrical prose just reels you in and immerses you in its story completely and effectively. Plus, twins! Who doesn't love twins! Esp. twins that make you think and are deep and complex! They're both definitely deep and complex, the perfect way to describe them. It's beautiful Faye. You know when you finish a book and your first response is a happy sigh, that's just how incredible this book is. Immaculate, lyrical and beautifully written. YAY I AM SO GLAD YOU LIKED THIS ONE. I loved this one. I JUST ADORED IT. And I kind of wailed a bit because gee Jude and Noah were super cruel to each other. But they're so adorable. I loved both of their POVs, although Noah was squishily cute and he totally needed a hug and Brian needed a thump. Imo. ALSO YOUR HEADER IS GORGEOUS. I LOVE IT. I LIKE THIS WHOLE BLOG. Just sayin'. Thanks Smushy, I really appreciate your kind words. I LOVED this one too. Even with their issues, I loved the realism of their relationship. Most of the books with twins that I've come across have had close relationships, loving and kind. But let's face it, when you've got a sibling, it's never all puppies and rainbows and I loved how complex their relationship was. So, SO beautiful. Ahh, I already feel like rereading it again. I WANT TO READ THIS SO BADLY. And it just sounds so beautiful, and lyrical, and amazing! I heard there is a lot of art in the book, like on the pages! Which is just really awesome. AND TWINS. I don't remember reading a book about twins as the MCs, but I may be wrong. AWESOME REVIEW KELLY. I have to say, this cover looks better than the US cover imo. It is poppet and I think it's the UK and Australian releases that have the art and not the US released version, but I could be wrong. Check before purchasing, because you'll want the artwork throughout, it was all lovely brushstrokes and really interpretative and so lovely. Spot on. I love lyrical contemporaries, especially this year with so many incredible titles being released. This is by far my favourite so far, and I suspect a long time to come. It was joyful, poignant and utterly beautiful! You've got me... I SO want to read this book! You definitely won't be disappointed, it's so incredibly beautiful. Hopefully you can grab a copy soon. I very nearly bought this yesterday but didn't. And now I'm wishing I did! Wonderful review Kelly :) I will have to pick up a copy soon! Oh no Wattle. You must run back and purchase it. It's incredible and so beautifully lyrical. Quickly, go now while the shops are still open. I need to buy a hardcover of this one in my next book purchasing spree too. It's so lovely that there's no doubt I'll read it again and again. Thanks Eugenia, so glad you really enjoyed this one too.